«Imam Bayildi» means «The Imam fainted» in turkish. According to tradition, the Imam fainted, when he found out how much olive oil his wife used, while frying the aubergines. So instead of fainting, I prefered baking! «Imam bayildi» consists of fried aubergines, which are then simmered in a tomato sauce with lots of garlic. Instead of frying the aubergines, onions, garlic etc, I baked the entire dish in an oven pan. I did use a fair amount of olive oil, but a lot less than what the traditional recipe calls for. All you need is a giant loaf of crusty bread to dig in. Preheat oven to 200 C. Cut the aubergines, lengthwise in 4 pieces (in wedges, not slices). Take a small sharp knife and slit little pockets on the skin side of the aubergines. Stick in 1-2 slices of garlic. 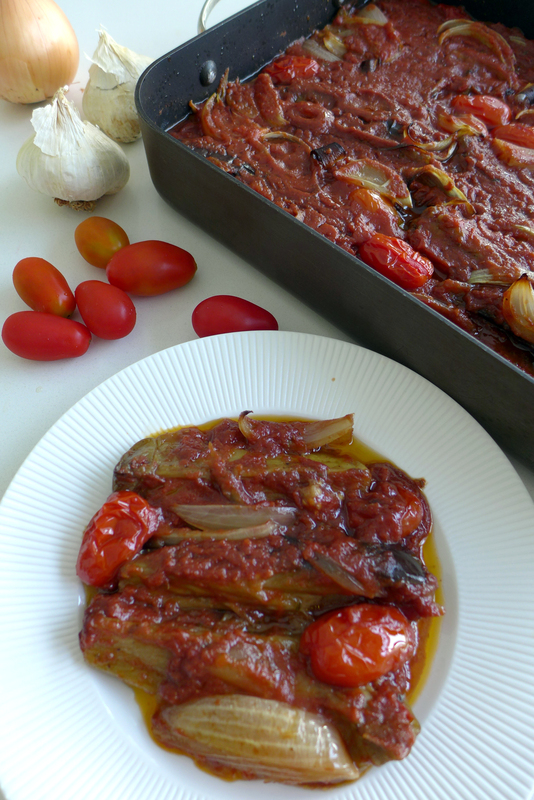 Put aubergines in an ovenproof dish or baking pan, together with the onions. Season with the oregano, salt and plenty of freshly ground black pepper . Drizzle over ½ cup olive oil and mix well. Bake for 30 minutes. Take pan out of the oven and add the cherry tomatoes, scattered. Bake for 15 minutes more. In a bowl mix the grated tomatoes with the rest of the olive oil (1/4 cup), vinegar, sweet wine and season with salt and pepper. Add this to the pan and cover tightly with a large piece of foil. Reduce the oven temperature to 175 C and bake for 30 minutes. Leave to cool for a while. Serve with crusty bread.